Spider-Man is the best superhero game that exists right now. It earns this title for so many reasons. Not just the superbly realised world of New York. Not just the simple yet challenging character action combat. Not even the intuitive webswinging that anchors the whole game. Spider-Man is the best superhero game because it understands the genre better than any so far. It is a game about being a hero, and doing good. To start with, a superhero needs people to help, and a world to save. The world of Spider-Man is a convincing one. The skycrapers of New York are latticed with beams of light during the sunset, or the ground is spattered with puddles when the rain kicks in. Just inhabiting the city is constantly being presented with sumptuous visuals. There are of course, plenty of tall buildings and skyscrapers to swing from. There’s also all the usual New York landmarks, as well as few Marvel specific additions. As an open world game, there’s the usual bevy of icons to clear from a map and collectibles to find. Specifically, there’s a set of Backpacks to find that belonged to a younger Peter Parker. Each one of these provides a little more backstory for this version of Spider-Man, and some feature not so oblique references to previous Spider-Man games or movies for long time aficionados. It’s a very pleasant way to populate the skyline of New York with activities beyond missions. As for the citizens of New York, the streets of Manhattan teem with people all the time. Spider-Man’s attention to detail and commitment to making a world worth protecting shines through. When Spidey swings down to ground level, the passersby react to him with gasps and commentary. What really stands out though is that Insomniac gives players the tools to engage with this world with non violent means. 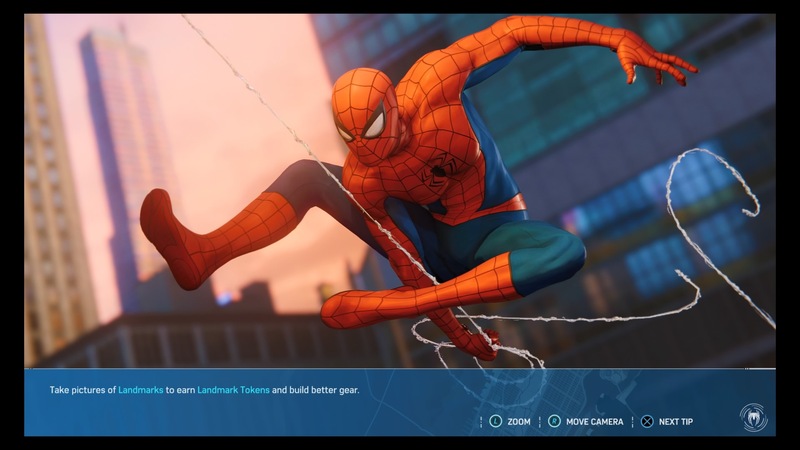 Tap the square button while you’re near civilians and rather than delivering a flying kick or punch, Spidey waves, or sends out the finger guns. And more than that, every so often, he gets the chance to directly interact by high fiving or taking a selfie with the crowd. It’s a perfect way to remind the player that this world is supposed to be a real place filled with real people worth protecting. 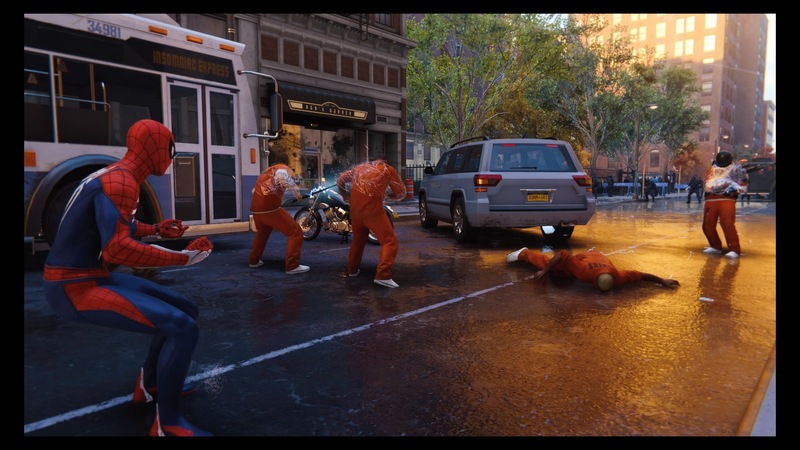 Beyond these direct interactions with civilians, the game reacts to Spider-Man’s actions in two distinct ways. Firstly, any time the menu is opened up, the official Spider-Man Twitter account (@nycwallcrawler, which is held but shamefully not being actively used in real life) is there. It will be filled with references to the recent game events, as well as whole mini narratives that help flesh out the residents of the city. Then there’s “Just the Facts” an (entirely optional) infotainment podcast from J Jonah Jameson where he riles against whatever vigilantism has recently been committed. It’s entertaining, and provides entertaining comedic listening as Spider-Man swings throughout the city. All of this really adds meaning and texture to the open world, so when the stakes inevitably scale upwards through the story, the player genuinely wants to save the city and the people within it. An open world is only able to be interesting if the player can tolerate travelling through it. If a player is skipping to the missions or fast travelling to avoid wasting time, well then the open world hasn’t captured them. This is not a problem in Spider-Man. Webswinging is amazing. Webswinging is a deceptively simple experience that never fails to entertain. Press X to jump. Hold R2 to attach a web to a point higher than you. Allow momentum to carry you in an arc that you point. Release R2. Watch Spider-Man do some flips and spins as he begins to fall back to earth. Hold R2 to swing again. Repeat forever and barely accomplish anything else in the game for the first few hours of playing because the basic traversal is so good it could be an incredibly fun game all on its own. I handed the controller off to a couple of people while playing this game to see how they coped. After a brief explanation, they were happily swinging away, without any difficulty. In addition, there a couple of additional tricks available like tapping X mid fall to go quickly in a straight line, or pressing R2 and L2 to quickly Zipline to a building edge, or dashing along the side of a skyscraper to build up speed before launching back into the sky. All of these allow for additional control that enhance that feeling of mastery the player develops as they get used to navigating the city. The fast travel in Spider-Man is a very useful and accessible feature that can save time in a pinch for getting to critical locations. Throughout my time with the game, I never wanted to use it. To do so would be to deprive this game of its greatest feature, and deny the player the chance to do what a Spider can, to swing from a thread, arriving to the scene of a crime just in time. Ordinarily, the scenes of these crimes do involve Spider-Man performing violence upon some overconfident thugs. That radioactive spider blood does give him Super Strength of course, so fights trend towards 6 or 7 on 1 for the most part. It evens the odds that way. Combat tends to thus be a three part affair. 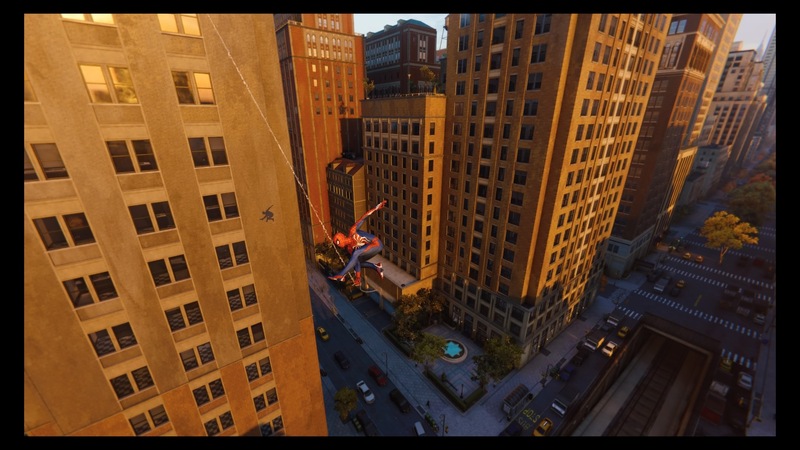 In a style that will be familiar to fans of the Arkham Series, or character action games, combat in Spider-Man focusses on Combos, Crowd Control and Dodging. Consistently landing hits on enemies builds up a combo for Spider-Man. This focus allows the player to activate special suit abilities, do more damage, and heal themselves. Combat itself is fairly straightforward, with Square to attack, Triangle to Web Attack, R1 for web shooter gadgets and R2 and L2 for throws. This simplified suite of moves pairs nicely with the webswinging and web zipping to allow for a lot of control over the environment, and encourages the player to experiment with getting around obstacles and using the environment to their advantage. You’ll need to as well, as enemies are often scattered around on different elevations around buildings, meaning keeping aware of the crowd is a must. The environment and the aforementioned web shooter gadgets play a big part in the crowd control element of fights. At any point, Spider-Man can use his default webshooters to temporarily take an opponent out of the fight. Should that opponent then make contact with a wall or surface, the web will expand and keep them pinned there. Pair that with gadgets like impact webbing that also send a single opponent flying backwards, or web bombs that trap anyone caught in range, and 6-7 opponents start becoming a lot more manageable. It is an absolute delight planning out how to use these gadgets, with this really getting across the clever combat that makes this game more than a simple brawler. There’s a caveat to this though, in that in the mayhem of fights, dodging blows can sometimes be an issue, especially when there’s a lot going on. The main tell is the pale white spider sense icon that appears around Spidey’s head, which signifies the timing to press the circle button and Dodge out of the way. Considering just how much is going on, this tiny icon can get lost in a mass of bodies or explosions as fights get messy in the 3D arenas they take place in. The healing system and checkpoints are fairly generous, meaning death is not too much of a setback, but it can get a tad demoralising watching Spider-Man get knocked down by the enemy who walked up while a particularly good combo was going on. Another minor frustration is in the boss fights for the game. Understandably, considering Spider-Man has one of the best collections of villains in comics, Insomniac have included quite a few in the game. All of these have really interesting designs, and are realised superbly. The issue is that as far as actually taking these boss fights on goes, they are kind of repetitive. The core conceit is straightforward, Web up boss or throw object at them, web grab attack, punch punch punch, repeat. This is functionally how it works for all of them, with the exception of a few quick time events going on, or a stage hazard being thrown into the arena. These are all very cool fights, in very pretty locations, but they do have that samey quality to each one as the game goes on. What’s really quite frustrating about this is that the villains are, for the most part, actually quite well defined and explored. The fact that their boss fights aren’t more unique does a disservice to their characterisation in the rest of the game. The fantastic character work doesn’t just apply to the Villains though, as between the writing and the voice acting, this is a game and story that is absolutely driven by the characters. The decision to have the story feature a Peter Parker who’s been Spider-Man for eight years, and to rework the rest of the supporting cast accordingly, makes this a story that even those who know their Spider Lore can appreciate with fresh eyes. In particular, the rework of Mary Jane Watson into an investigative journalist is a very interesting change. It results in the game featuring several sequences where the player takes on her role in the story. This changes up the gameplay to focus on a slower stealth oriented style of gameplay, while allowing MJ to explore certain environments and flesh out the story. Similarly, on several occasions Peter Parker will be playable, solving simple electrical circuit puzzles or matching patterns as a means of performing science experiments. Both of these serve as extended character pieces, allowing insight into why they act the way they do and building up the rest of the plot. It also breaks up the story nicely, encouraging breathing space between the super punching and fast paced webswinging. This focus on characterisation and exploration of what drives the heroes of the story is what sets Spider-Man apart. What makes the story truly excel though is the way in which this story treats being a hero and doing good. To paraphrase a different Marvel Character, “Good is not a thing you are, good is a thing you do.” Spider-Man does a serious amount of good in this game, in a way that most games don’t. This is a story where one of the core locations is a homeless shelter. One with a cast of developing bit characters throughout the game. They are given respect, treated like actual people with needs and hopes, rather than unpleasant stereotypes. It’s a storyline that is filled with human empathy, good deeds and kindness. Spider-Man may spend his time webbing muggers to walls and assisting the various citizens of New York in side missions, but what does Peter Parker do? Well when he’s not volunteering at the aforementioned homeless shelter, he works to develop medical technology that will help improve the world for those who need it. Even when he’s Spider-Man and quipping away, there a genuine sincerity that voice actor Yuri Lowenthal should be commended for capturing. As the story goes on, all of the various threads begin to combine in a fashion that closely follows comic book conventions and tropes. The pacing is superb, with the game understanding when to escalate and when to recede in the finest traditions of a big comic storyline. What never changes though is the focus on helping people, protecting people and doing the right thing. And by the end, the narrative reaches an engrossing conclusion that only leaves the player wanting more. As a character, Spider-Man’s whole motivation is that with great power there must also come great responsibility. 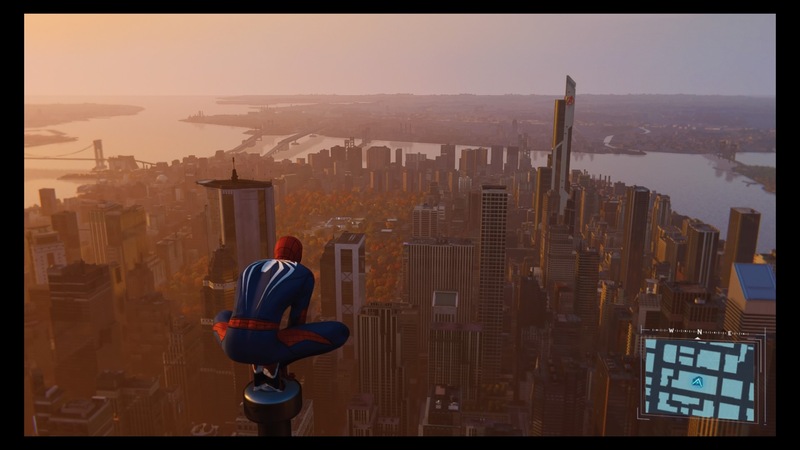 It must be said that there can be no higher compliment to the developers that this game isn’t just a power fantasy about punching up muggers or zipping around New York. It takes that creed seriously and ensures that the entire game and story is grounded in understanding the character’s responsibility to the city and it’s people. It’s not enough to just be a game about being Super. Spider-Man is a game about being a Hero.